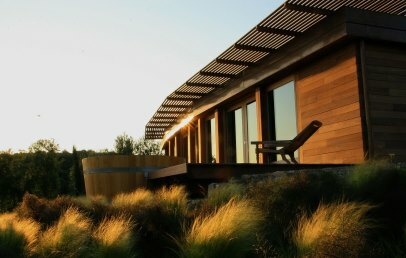 It is an exclusive luxury retreat where to regenerate and enjoy a stay embedded in a pure nature. 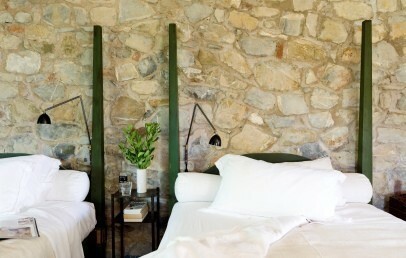 Castello di Vicarello is a luxury charming hotel that occupies a splendid position in Tuscany's Maremma region. 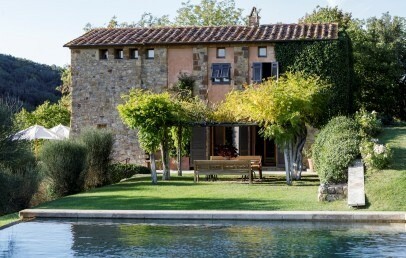 It is in the countryside close to Grosseto and the sea is just 30 km away. In a range of 40 km, reachable by car, there are the fascinating towns of Montalcino, Pienza, Montepulciano and Siena, Castiglione della Pescaia, Porto Ercole, Argentario, the Natural Park dell’Uccelllina, Terme of Saturnia, Terme of Petriolo, Terme of Venturinae and Bagni San Filippo. Arriving by plane it takes approx. 2 hours from Rome Fiumicino; 1h30 from Florence and Pisa Airports and approx. 45 mins. from Grossetto Airport. It is a historic residence dating back to the year 1100. The buildings of the Castello di Vicarello are built around a courtyard which are accessible through an arched gate. After a long and careful restoration the castle has been faithfully brought back to its former glory. Olive groves, vineyards, forests and gardens that surround the castle offer lovely views and enhance the guests to discover the countryside. 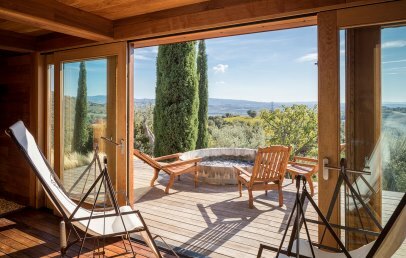 In the garden of Castello di Vicarello are two pools, one has a panoramic view and the other is heated with solar panels, hidden among the olive trees. 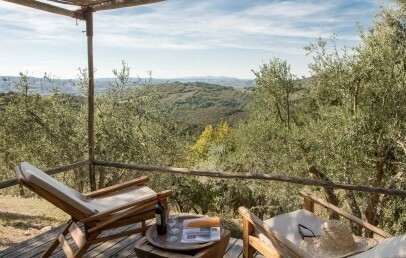 Both offer the opportunity to spend time relaxing and enjoying the landscape of the Tuscany’s Maremma. Eight different vvery nice accommodations that can host from 2 to 6 people. 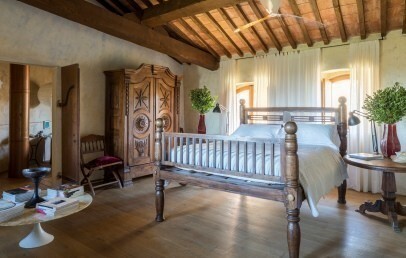 Though keeping the fascination of its history these rooms are all equipped with the modern comforts and the highest standard, valuable furnishing and objects gathered through years of travelling, all chosen to provide a feeling of harmony with the surroundings. The Wi-Fi internet connection is available throughout the entire hotel. 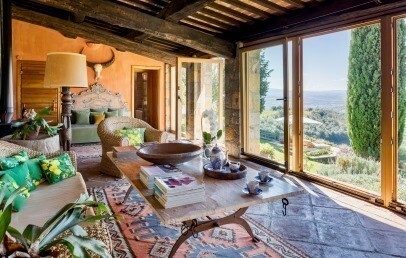 Suite Chiesina – an independent Villa embedded in the garden in front of the infinity pool, composed by 1 bedroom with living room with the possibility to add two beds, bathroom with tub, living room, equipped kitchen, terrace with panoramic view, pergola and little barbecue. 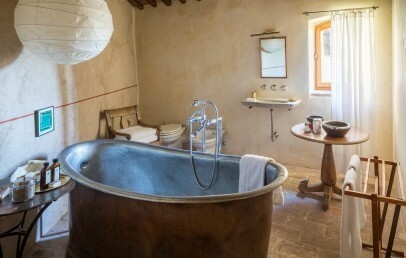 Suite Grotta – with two French beds, stone walls, bathroom area with tub, living area, windows with panoramic views over the gardens, small terrace and independent entrance. 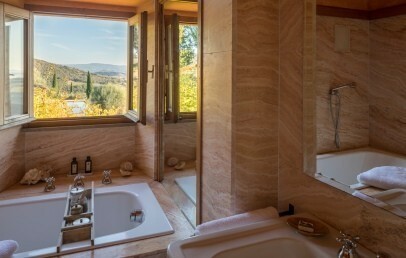 Suite I Sassi – beautiful independent Suite, bathroom with tub and shower, living area, small kitchen corner to prepare coffee or tea, terrace with panoramic view. 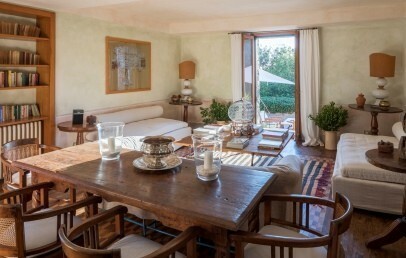 Suite Sprone – stunning suite distributed on two levels with access from the courtyard. It is composed by a living room with fireplace and four poster bed/sofa, possibility of a third bed, bedroom, bathroom with tub and separate shower, romantic panoramic view. 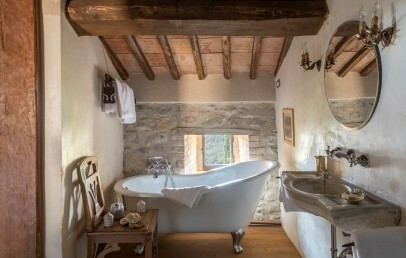 Suite Il Giardino Segreto – suite with access from the castle’s courtyard distributed on two levels composed by a bedroom (at the upper floor) with bathroom with tub and separate shower, small cooking corner to prepare coffee or tea, minibar, living room with fireplace made on "Terracotta", access to the private garden with panoramic view. 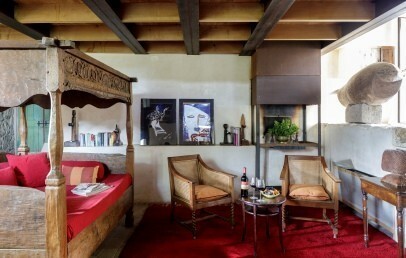 Suite Vicario – located on the first floor and has the access from the courtyard. The suite is spacious with a living room, a fireplace, a four poster bed/sofa that can accommodate eventually 2 more people, a double bedroom separated from the living room by a door, a bathroom with shower, small cooking corner to prepare coffee or tea. Amazing panoramic view. 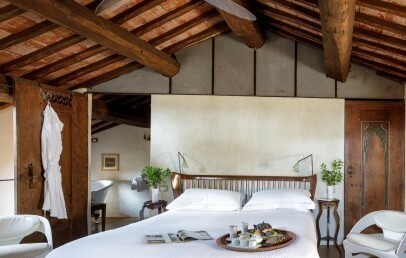 Little Suite – located in the courtyard of the castle, distributed on two levels and offers a nice view over the valley. 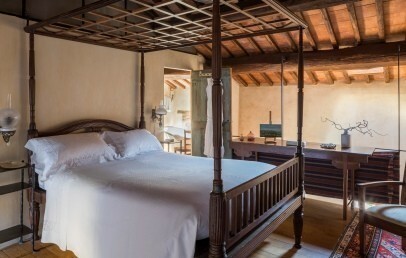 The Suite has taken the name from the ancient Chinese four poster bed. 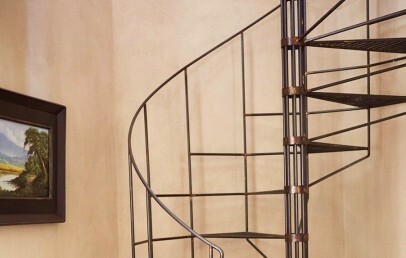 The bathroom with shower is reachable by a wrought iron staircase. 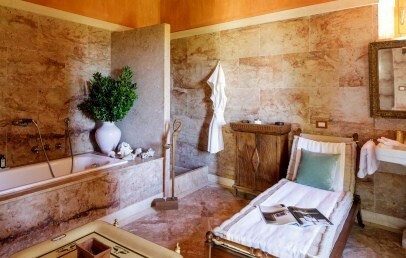 SPA Suite – located in a panoramic position with double bed, private sauna, turkish bath, shower, terrace. 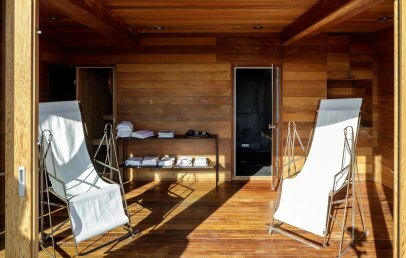 Ideal for a relaxing stay and full well-being immersion. The restaurant of the Castello di Vicarello offers its guests delicious traditional local dishes, prepared with local biologic products of the property. All the gastronomic delicacies are accompanied by a very good extra virgin olive oil and a good wine both biologic and produced in the property. 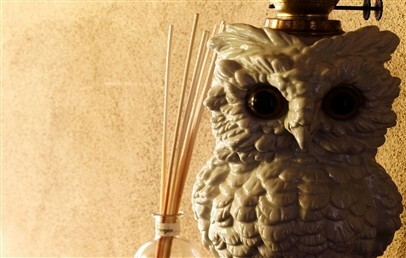 The concierge is at guests disposal for any need. It is possible to organise cooking classes or wine degustation and massages. In the hotel are 2 pools, a parking area, a library and a boutique with natural products. Nearby it possible to practise horseback riding (20 km distance) and golf (approx. 50/60 mins. drive). 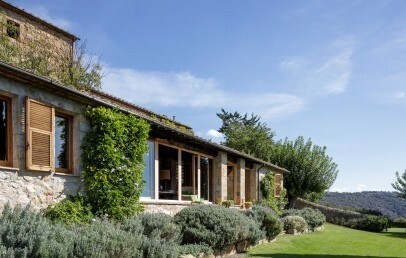 A spacious and independent Villa embedded in the garden and in front of the infinity pool. The Suite has one bedroom with a spacious living zone, located on the upper floor and offers the possibility to add two single beds. 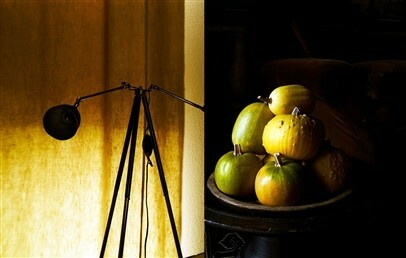 The decoration is elegant with paintings of modern arts. The bathroom has a tub and modern comforts. The living room on the ground floor has comfortable sofas, a dining table and a fully equipped kitchen. 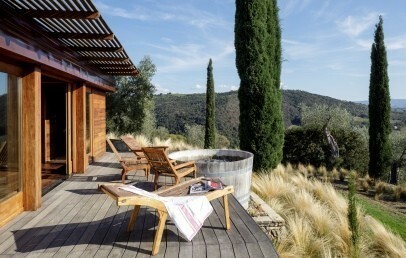 The panoramic terrace is covered by a pergola and has a little barbecue. 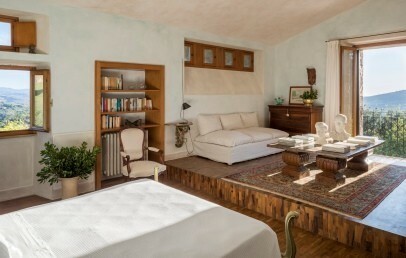 Beautiful Suite with living room and a small fireplace, located in an independent building. 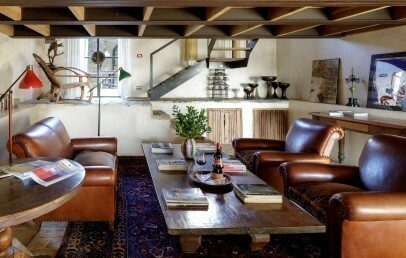 The interiors are in coral hues, have a warm furniture and transmit sensations of peace and well being. Within the living room there is small kitchen corner to prepare coffee or tea, minibar. The bathroom has a tub and shower. From the nice terrace is a lovely panoramic view. The suite is located on the first floor and has the access from the courtyard. 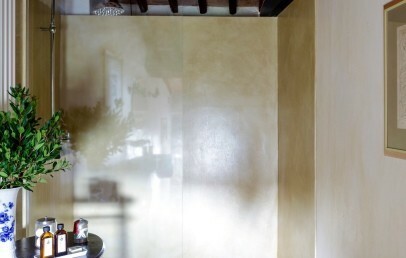 It is decorated with elegance and taste, mixing ancient and modern elements with oriental touches. The original stone and bricks walls have been restored. The suite is spacious with a living room, a fireplace, a four poster bed/sofa that can accommodate eventually 2 more people, a double bedroom separated from the living room by a door, a bathroom with shower and tub, small cooking corner to prepare coffee or tea and an amazing panoramic view. 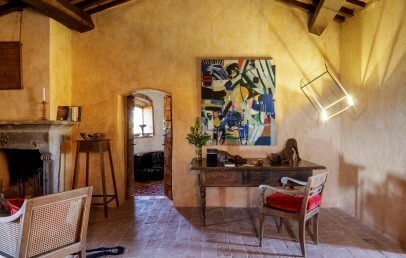 Nice Suite distributed on two levels with access from the courtyard of the castel. 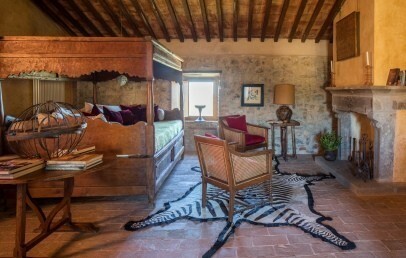 It is decorated with a mix of Italian art of the fifties and seventies plus an antique four poster bed. It has a living room with fireplace. 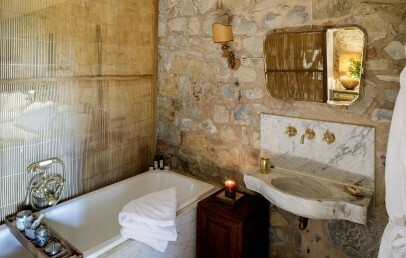 The bathroom has a tub and a shower with modern comforts. Guests can enjoy a beautiful view of the courtyard and the surrounding hills. 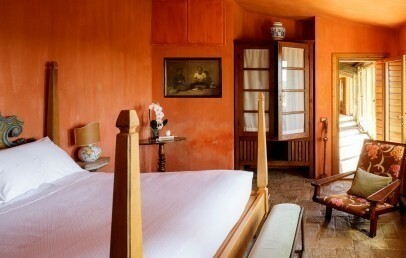 Suite spread over two levels with four-poster bed, a cozy living room with a terracotta wood burning stove and a couch. The bathroom has a tub and all the modern comfort. 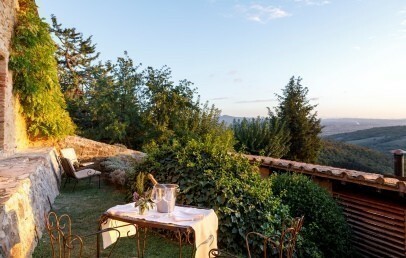 The Suite has also a small private garden and a lovely view over the surrounding hills. 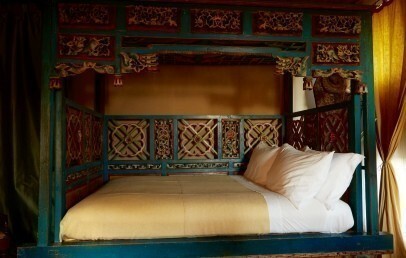 Double room with an antique Chinese bed, set on two floors. It is decorated with elegance and taste, mixing ancient and modern elements with oriental touches. The original stone and bricks walls have been restored. The bathroom with shower is reachable by a wrought iron staircase. The windows offer a lovely view over the valley. 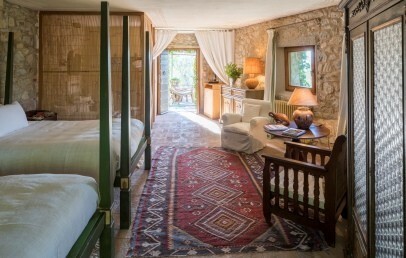 Double room with two French bed, decorated with elegance and taste, mixing ancient and modern elements with oriental touches. The original stone and bricks walls have been restored. The bathroom corner has a tub. It has a small kitchenette with private outdoor sitting room. Panoramic view from the small private outdoor area. New and elegant SPA Suite with a contemporary design, located a few steps from the castle and with breathtaking view over the landscape. The Suite expands on only one floor and has a private Turkish bath and private sauna, large terrace with outdoor hot pot whirlpool. The bedroom has a king-size bed. A smart-system is available for a 24-hour butler service with the simple use of a provided Smartphone. The Suite offers total privacy and total immersion in well-being. Advance Booking Non-refundable - Book at least 30 days in advance and get 10% reduction on your stay. The Advance Booking rate is a non-refundable one and the total amount of the stay is to be paid upon confirmation.